Republican Presidential candidate Donald Trump has claimed that former Republican President George Bush should be charged with responsibility for the terrorist attacks on the United States that occurred on September 11, 2001. 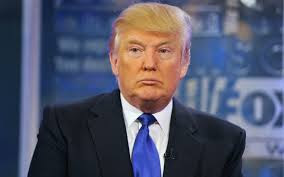 Trump has been taking some flak for that assertion, particularly from Jeb Bush, the former President's brother, who is also a candidate for the Republican Party nomination for President. Recent news articles seem to indicate that there has been a "backlash," going beyond members of George Bush's immediate family, and that various categories of people have been irritated by Trump's statement. Trump seems to be dodging further questions on the topic. He was president, OK?... Blame him, or don't blame him, but he was president. The World Trade Center came down during his reign. This explanation conclusively demonstrates (at least to me) why Mr. Trump is an unsuitable candidate for President. Whether or not George Bush should be held responsible for 9/11 may well be debated, but there is no debate that presidents do not "reign." Donald Trump doesn't understand what a President does, in a democracy. Let me repeat it, for emphasis: Presidents don't rule. Presidents don't "reign."